Now that the regular season is complete, let’s take a look at how teams fared in a variety of statistical categories and how those compare to their performances last year. This chart shows offensive rating in blue and defensive rating in red for each team and is sorted by points per 100 offensive possessions. 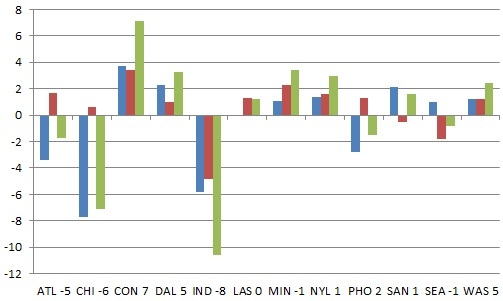 The difference between the two is the net rating as all four non-playoff teams had negative net ratings and all eight playoff teams had positive net ratings. Defense was a common thread among the worst teams in the league as the five with losing records had the five worst in the league. The two teams that were worst on offense ended up struggling the most as their porous defenses also did not help them pick up wins. The two teams that ended up with the best records had different approaches. Seattle’s dominance was built at both ends of the court, ranking second at both types of efficiency. Atlanta had the league’s best defense, getting just enough on offense to win a number of close games. 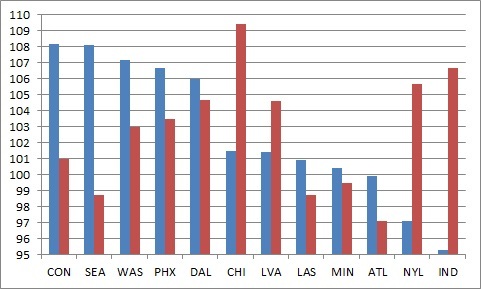 Teams are ranked by their offensive improvement as the blue bar represents the change in offensive rating and the red bar represents the change in the defensive rating. Team win totals changes are listed next to the team name. A negative change in defensive rating is good because it means fewer points were given up per 100 possessions. 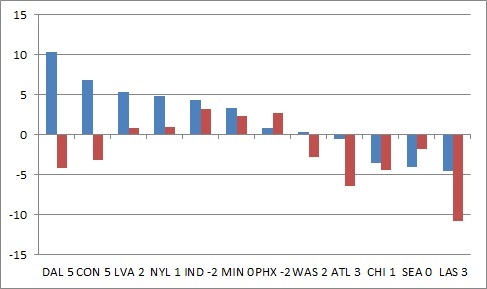 Even though Bill Laimbeer has a reputation as a defensive coach, it was the offensive change that was in the right direction for the Aces as they had a greater improvement in that category than any team. Seattle’s improvement was on both ends of the court, especially defensively and Atlanta’s similar improvements showed why both increased their win totals the most. 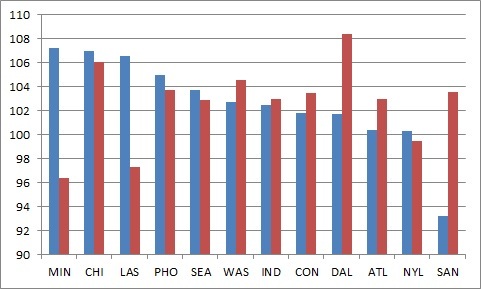 Washington and Dallas also improved in both categories even though Dallas did not improve their record. The three teams that had the best net ratings a season ago all saw them drop drastically, contributing to the three worst drops in wins. The Liberty had the third best defense a year ago, but ended up with the third worst this season and their offensive efficiency also decreased. Minnesota was the leader in both categories last year and saw large drops while Los Angeles still maintained the second best defense even with a decrease while watching their offense suffer as well. 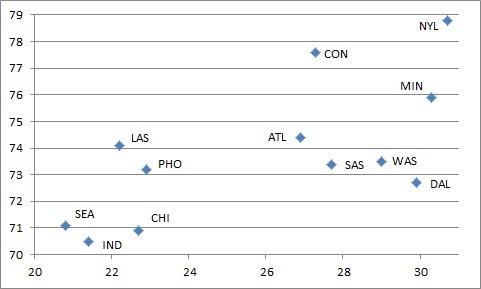 Defensive rebounding is shown on the y-axis while offensive rebounding is shown on the x-axis and both are expressed in percentages of opportunities available. Separating the two is especially important in evaluating defensive rebounding as different teams show different levels of interest in offensive rebounds compared to getting back on defense. Minnesota featured two of the top rebounders of all time and as a result were the best in the league at limiting their opponents’ opportunities. Chicago was the only team to fail to even grab 70% of their opponents’ misses, which may have contributed to their league-worst defensive efficiency. Connecticut and Dallas were among the league leaders in both categories, but were especially dangerous on the offensive end. The Sparks were average on the defensive end, but were the only team to grab less than 22% of their own misses, which may reflect a strategic decision. Phoenix was second worst in both categories. The x-axis represents change in offensive rebound percentage and the y-axis represents change in defensive rebound percentage. Both are measured in absolute terms and not as a percentage change. Three teams improved in both categories with Seattle’s new look frontcourt clearly helping them on the glass with the biggest gains in both categories. Four teams decreased in both categories, but none as severely as the Liberty as their general downfall was shown quite clearly as they were the league leader in both categories last season, but fell back into the pack this year. The Sun had a big jump to become the league’s best offensive rebounding team while Minnesota shored up their defensive rebounding even though they had a similar decrease on the offensive end. There were few other interesting team stats changes this year in other categories. Minnesota was the only team to not improve their assist to turnover ratio this season. The biggest improvement was shown by Las Vegas, which saw the amount of possessions ending in a turnover drop by five and a half percentage points, which had to be a factor in their improved offensive efficiency. Free throw rates dropped for most teams, leading to a decreased reliance on the stripe as a source for points while most teams got a higher percentage of their points from the behind the arc with the Aces as a notable exception due to finally having a post presence. 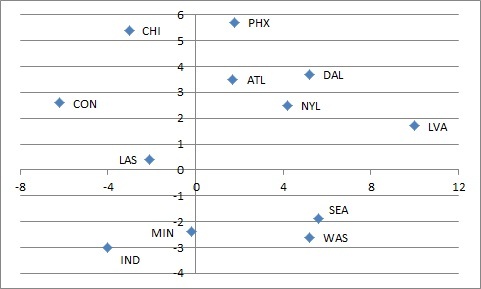 New frontcourt players also changed the rates at which teams block shots as Seattle and Dallas had the biggest jumps. The chart on the left shows how teams got their points while the chart on the right shows how they gave them up on the defensive end. The bottom of each bar is two pointers, the middle is three pointers, and the top is free throws. Las Vegas was the team that was least reliant on generating offense behind the arc, 7 percentage points below the next closest team and the only team to not score at least 20% of their points from distance. Unsurprisingly they were first in percentage on points from inside the arc and second in percentage on points from the line. Phoenix was the only team to score less than half their points from inside the arc while Seattle was the only team to get more than 30% of their points from long range. There was much less variation on the defensive end, but the Liberty gave up the highest percentage of opposition points on three pointers and free throws. Looking at the stats put up by opponents can also be useful in other categories. The Sparks forced a greater percentage of turnovers than any other team, helping their opponents have a worse collective assist to turnover ratio than any individual team. The Sky were in the middle of the pack when it came to forcing turnovers so the high assist to turnover ratio of their opponents should be attributed to a large number of assisted field goals. 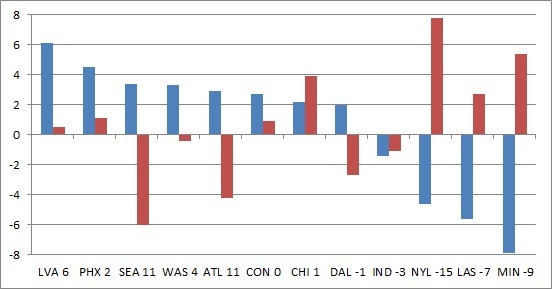 Los Angeles was the best team at avoiding having their shots blocked while Chicago had the worst percentage. The Liberty gave their opponents the most free throws compared to field goal attempts while the Lynx and Storm gave up the lowest free throw rates. The blue bars represent the difference in offensive rating on their home court and on opposing courts and the red bar represents the difference in defensive rating on their home court and on opposing courts. A negative number for defensive rating means that the team has a more efficient defense at home and teams were sorted in order of the biggest difference in offensive rating. Each team the difference between home wins and road wins next to their name. Four teams were more than three wins better on their home courts and they were better on defense on their home courts. 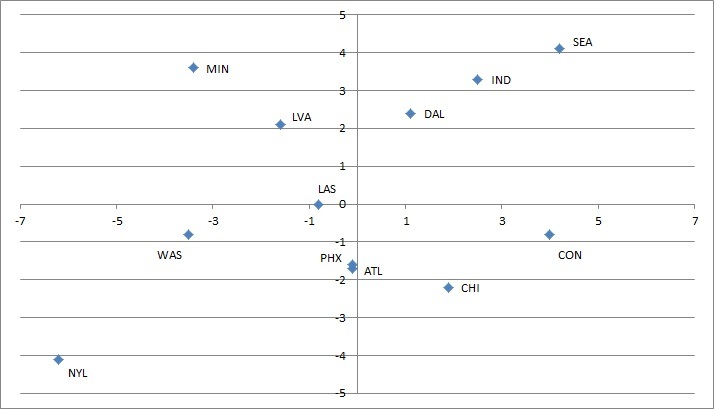 Dallas and Connecticut were five wins better at home as they had the two biggest offensive advantages while Washington was the only other team to be more efficient on both ends of the court. Los Angeles and Atlanta, on the other hand, had the two biggest defensive improvements at home, but both had less efficient offenses. Indiana and Phoenix were the only teams to win more games on the road than at home and it appears that worse defense should be blamed as both teams were better offensively at home. All teams were better on at least one end of the court at home. The y-axis shows the difference in defensive rebound percentage at home compared to the road while the x-axis shows the difference in offensive rebound percentage at home compared to the road. Scale is based on absolute percentage points and not the ratio between the two. Five teams grab a higher percentage of misses at both ends of the court at home while Indiana is significantly worse at home on both ends and Minnesota less so. The Sun are the best team overall at offensive rebounding, but that advantage seems to come primarily on the road where their percentage is more than five and a half points higher than their closest competition. The Sky and Mercury are the two worst defensive rebounding teams in the league, but that should be blamed more on their inability to secure rebounds on the road than at home. Seattle and Los Angeles turned the ball over more at home than on the road, leaving them as the only two teams with a worse assist to turnover ratio at home while Chicago managed to avoid a similar fate despite difficulties hanging on to the basketball at home. There was no overall trend for block percentage, but the league’s best shotblocking team Atlanta made sure to give their home fans a little extra to cheer about defensively while Connecticut was more likely to be silencing the opposing fans. Free throw attempts as a ratio of field goal attempts was a little higher at home, but not dramatically so. With more and more types of statistics available, let’s take a look at the league leaders in a variety of non-traditional measures. Players who were on the court for 700 possessions are included with the last team listed for players who appeared for multiple teams this year. 24 players were responsible for terminating at least 23% of their team’s possessions while they were on the court. While there are plenty of recognizable players on the list, there are also a number of new faces as four rookies and three players who were out last season are in this group. The impact of the return of Liz Cambage to the Wings was obvious as she had a higher usage than anyone else while A’ja Wilson was certainly called on to carry the load for Las Vegas early. 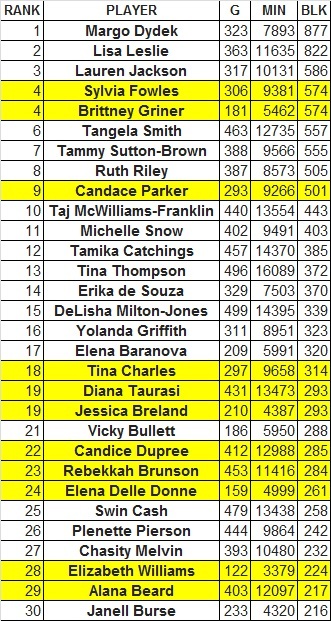 Tina Charles continues to be the main force for the Liberty as the higher number of possessions that she played meant that she terminated more possessions than any other player. Using usage instead of counting statistics is a good way of better understanding the impact of bench players and starters who may play fewer minutes. Amanda Zahui B played fewer possessions than the other players on this list, but when she was in, she was often the endpoint of the possession. A couple midseason moves also had clear impacts as Cappie Pondexter changed the dynamics around the Indiana Fever, which had been giving plenty of opportunities to Kelsey Mitchell in their rebuilding process. The trade of Alex Bentley also led to a high usage player switching teams, which could turn out to be critical after Atlanta lost Angel McCoughtry. Using the effective field goal percentage instead of the traditional field goal percentage helps take into account the value of the three pointer, allowing those who rely on shooting from the outside to be included among post players who take higher percentage opportunities. 20 players were over 55% once the added point from three pointers is taken into account. This method favors post players who can also shoot from outside so it was Jonquel Jones who led this category by a wide margin. Even in this measure, Sylvia Fowles finished second, showing the reliability of her offensive contributions even though she does not venture beyond the arc. While plenty of traditional posts are on this list, some of the league’s renowned sharpshooters got a solid boost with this method. Free throw rate measures the ratio of free throw attempts to field goal attempts. 15 players attempted at least 40% as many free throws as field goals. 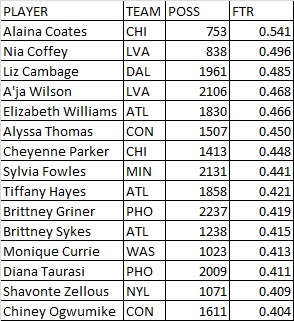 Alaina Coates did not play much in her rookie season, but a significant portion of her offensive attempts came at the stripe as she attempted less than twice as many field goals as free throws, the only one on the list to hit that level. 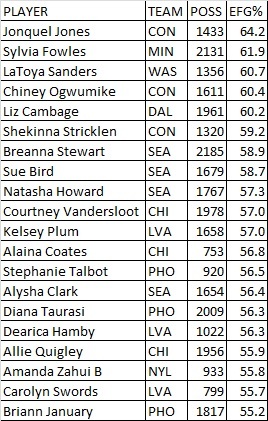 Liz Cambage leads the higher usage players on this list and that helped Dallas have the highest rate as a team. The group is a mixture of post players, who often find themselves getting fouled as they try to generate offense, and slashers whose style lead to trips to line on their drives. Using percentage instead of simply relying on rebounding totals helps us identify some of the players who play fewer minutes who are still proficient at grabbing boards. Separating offensive and defensive rebounding is also important because different teams have different strategic approaches to rebounding, especially on the offensive end. 19 players grabbed at least 8% of the available offensive rebounds while they were on the court and 19 players grabbed at least 20% of the defensive rebounds available when they were on the court. It does not matter which end of the court that we are talking about when it comes to Sylvia Fowles crashing the boards. She was the league leader in both categories and the amount of time she spent on the court compared to her closest competitors make those margins even more impressive. Courtney Paris did not play as many minutes, but when she did, she rebounded prolifically as her addition to Seattle frontcourt was part of the reason that they had league high improvement in both categories this year. 9 players appeared on both lists. 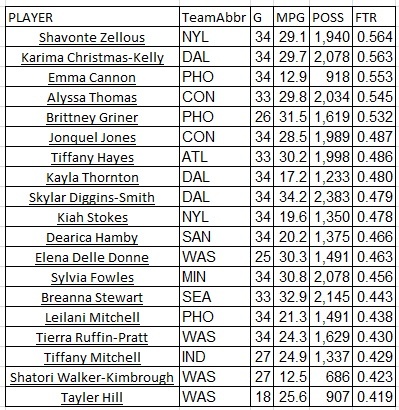 Brittany Boyd stands out as the lone guard on these lists as the Liberty’s decrease in rebounding prowess this year cannot be blamed on her. 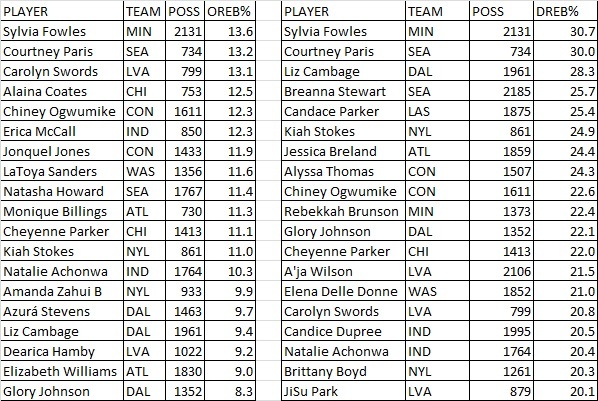 With the second season of the WNBA’s commitment to providing additional statistics complete, let’s take a look at how players stack up in some of the non-traditional measures. In order to be counted in these lists, players must have been on the court for 680 possessions, 20 per game that each team plays. For players who played for multiple team, the last team name is listed, but stats compiled for all teams are included. Usage measures the percentage of her team’s possessions that the player terminates while she is on the court. 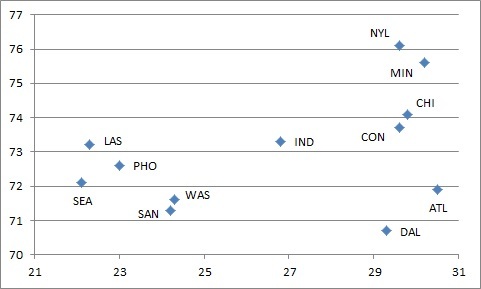 It provides two separate measures that help us understand a team’s offense, both showing which players are stars that a team relies on heavily and also identifying players who come off the bench or play fewer possessions, but take shots while they are on the court, which would not show up as much in traditional counting stats. Players with a usage percentage of at least 23% are included on this list. 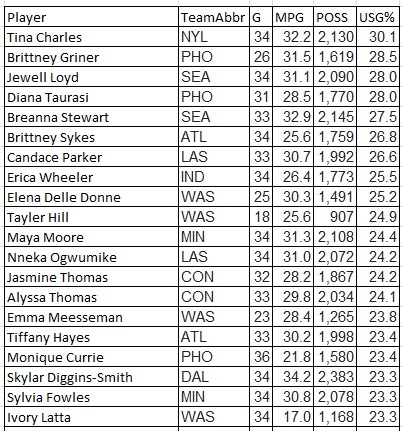 No single player may have been more critical to her team than Tina Charles this year and it showed on this list as she was the only player to exceed 30% usage and was the only Liberty player on the list. She is followed by two teammate duos as the young stars of the Storm and the Mercury’s veterans were leaned on offensively. Brittney Sykes pushed her way into the rookie of the year statistics as the season progressed and it was clear how she did so as she was given a larger and larger role over time. 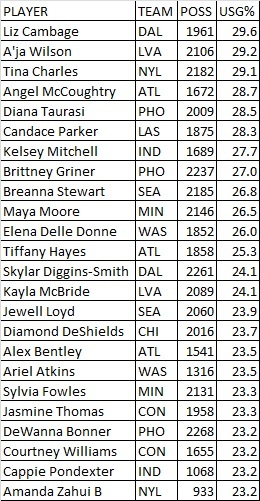 Unlike some other instances, the number of players appearing on this list with fewer minutes played was not particularly large as Monique Currie was asked to play a variety of roles on two different teams this season while Ivory Latta was the only player on the list to play less than 20 minutes per game. 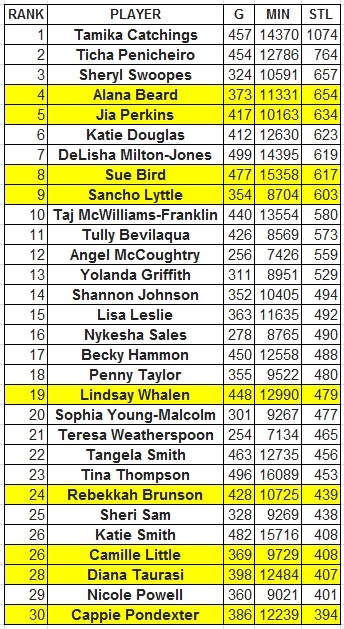 Skylar Diggins-Smith made the list as the only Wings player as she was on the court for more possessions than any other player in the league this season. Effective field goal percentage helps nullify the advantage that post players and others who shoot closer to the basket have on players who shoot more of their shots from distance. Three point shots are given more value to account for the additional point that they provide. Players who have an effective field goal percentage above 55% are included on this list. 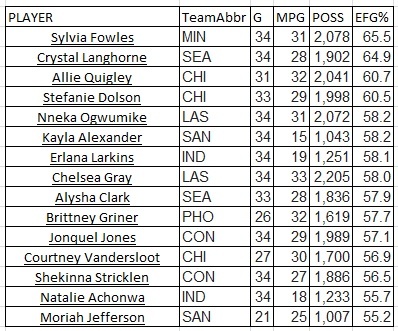 Adding points for three pointers did not change the leader in this category as Sylvia Fowles stayed on top without attempting a shot from behind the arc. 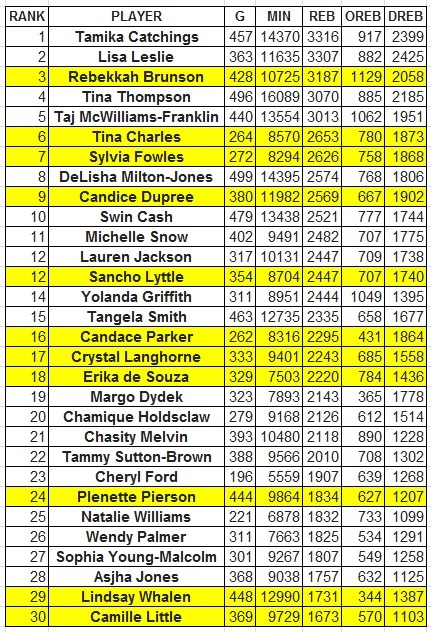 Crystal Langhorne was behind her while almost exclusively operating from two point range. The first player with a reputation as a sniper checked in at third as Allie Quigley’s percentage clearly benefits from this adjustment. Stefanie Dolson and Nneka Ogwumike get additional credit from this system as they mix a comfort of operating in the paint with an ability to stretch the floor. Free throw rate measures the number of free throws attempted as a percentage of field goals attempted. Players with at least 40% as many free throw attempts as field goal attempts are included on this list. Players who rank high on this list tend to be either post players or slashers. Five players attempt at least half as many free throws as field goals. While Emma Cannon is a newcomer to the league, the other four are certainly no strangers to the list. 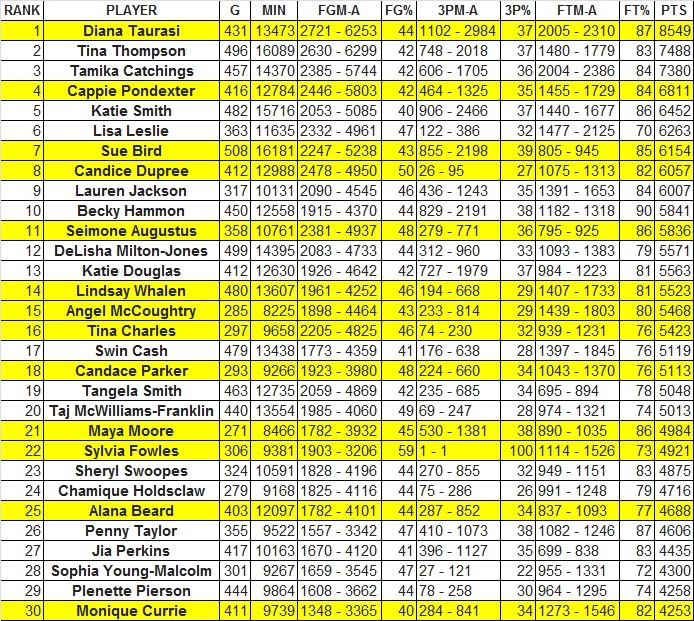 Alyssa Thomas just under 50% last year, but the other three were above and all in the top five on that list. 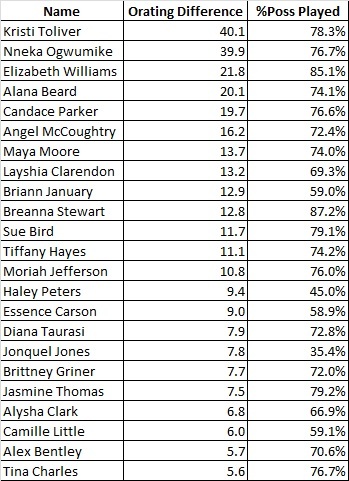 Shavonte Zellous, Karima Christmas-Kelly, and Brittney Griner all increased their percentages from 2016. While those at the top of the list had higher rates than last season, the number of players at 42% and over decreased as only 18 players were at that mark after 24 players hit that rate a year ago. Rebound percentage statistics help isolate multiple factors, not just controlling for minutes on the court. Offensive and defensive rebounding are separate, which helps account for team philosophy and player roles. The basis of measurement is available rebounds, which mitigates the effect of different field goal percentages. Players who grabbed at least 20% of available rebounds on the defensive end made that list and players who grabbed at least 8% of available offensive rebounds made the other list. Separate statistics are not needed to show that Jonquel Jones was dominant on the boards this season. She grabbed nearly a third of her opponent’s misses, more than five percentage points above any other player while also leading in the offensive category as she nearly doubled her defensive rebounding rate from last year with a big increase in minutes. The split better showcases Candace Parker’s rebounding as she was second on the defensive end, but not on the list for the offensive end where the Sparks were not among the league leaders, perhaps reflecting team philosophy. 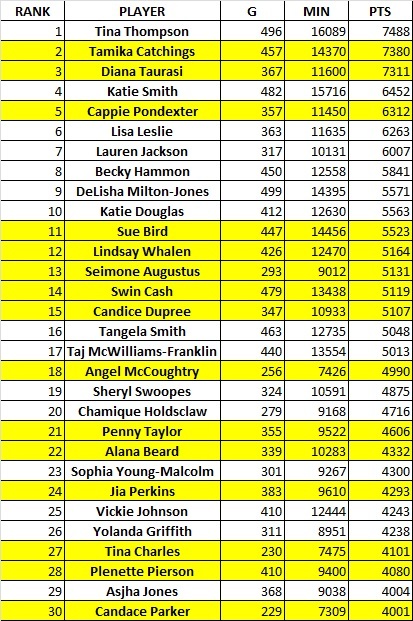 Other Mystics acquisitions deservedly had more fanfare, but this statistic shows another key move as Krystal Thomas was in the top three in both categories, one of nine players players on both lists as Tianna Hawkins also helped the Mystics rebound well. 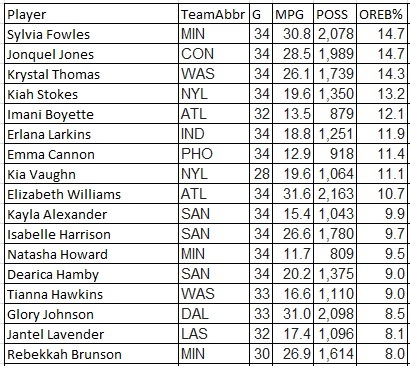 Sylvia Fowles and Rebekkah Brunson are both in the top ten of total rebounds all time, so it was no surprise to see them as the other pair of teammates to appear on both lists. There are many ways of attempting to calculate the impact of a player being on or off the court. One method is to calculate team offensive and defensive ratings when the player is on and off the court. This allows players across teams to be compared independent of how good the team is. If a player’s team has poor ratings, but performs even worse without her on the floor, these calculations can show her positive impact. Similarly, players on good teams will generally have solid ratings, but the team might not be playing much better with her on the floor. Like all methods, this is not a perfect way of measuring a player’s impact as it is affected by other factors, like the other players in the lineup and the different nature of garbage time. All players who only appeared for 1 team this season and played at least 680 possessions, which is 20 per game played by the team, were included in the calculations. The offensive chart includes all players whose on-court offensive rating was at least 5 points per 100 possessions better than the team’s offensive rating without the player on the court. The defensive chart includes all players whose on-court defensive rating was at least 6 points per 100 possessions better than the team’s defensive rating without the player on the court. Each chart includes the difference in the rating when the player is on and off the court and the approximate percentage of the team’s total possessions when the player was on the court. 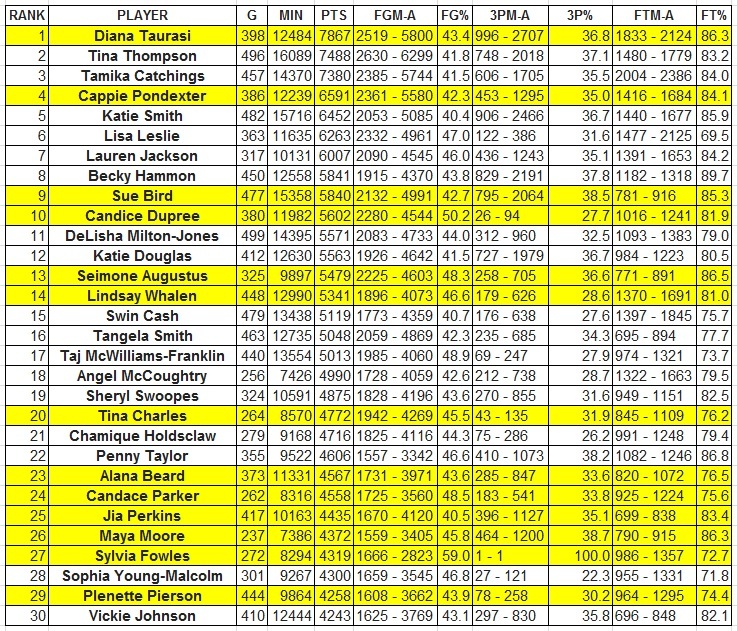 All stats are from wnba.com and calculations involved are subject to rounding and estimation. With the regular season complete, let’s take a look at some of the less traditional statistical categories to see how players stack up in a variety of metrics. 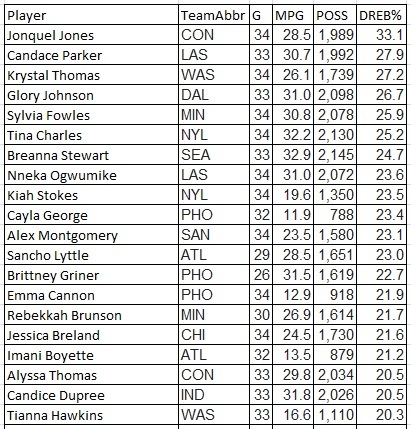 All stats are from wnba.com and include all players who have played for one team all season and been on the court for at least 680 possessions. Total column indicates number of possessions on the court. With the 2016 regular season complete, it is time to take a look at how players have moved up the career totals list and which records may be in danger in 2017. Looking at the 5 major counting statistics, it is the perfect time to reflect on the all-around impacts of Tamika Catchings, DeLisha Milton-Jones, and Swin Cash as they retire. 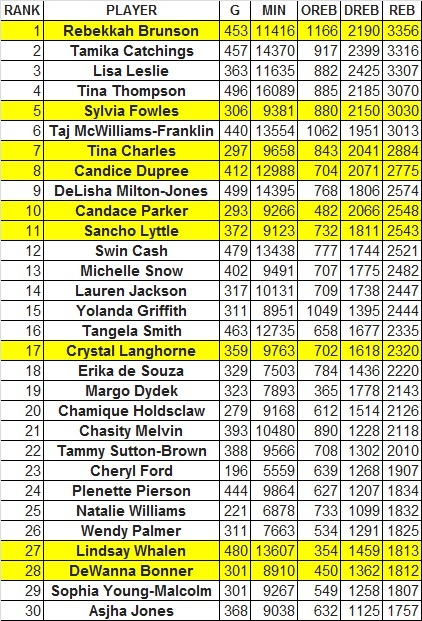 The 3 of them join Lisa Leslie and Taj McWilliams Franklin as the only players to rank in the top 30 of all 5 categories. 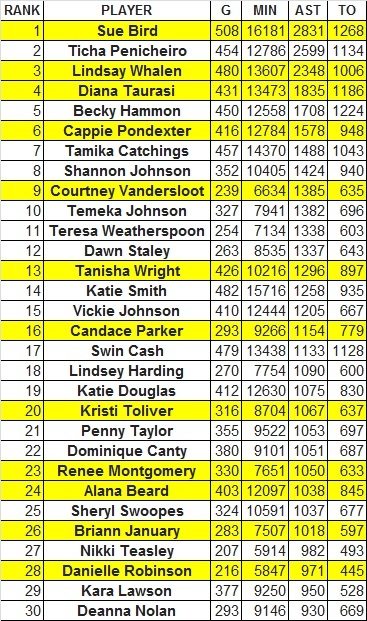 Catchings does so in impressive fashion, finishing no lower than 12th in any category, with her performance in blocks standing out even more when comparing her height to some of the other players on the list. 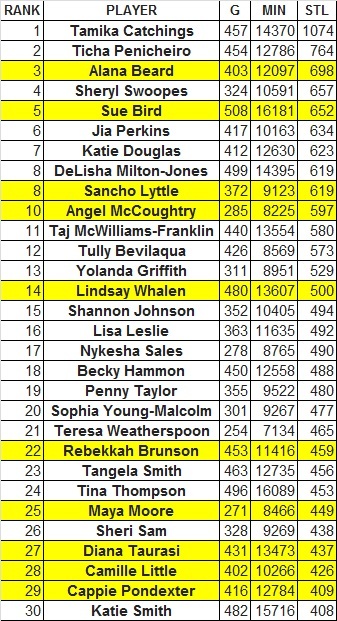 Her next lowest placement was 6th as she finishes 1st in both rebounds and steals with a 2nd place finish in points. 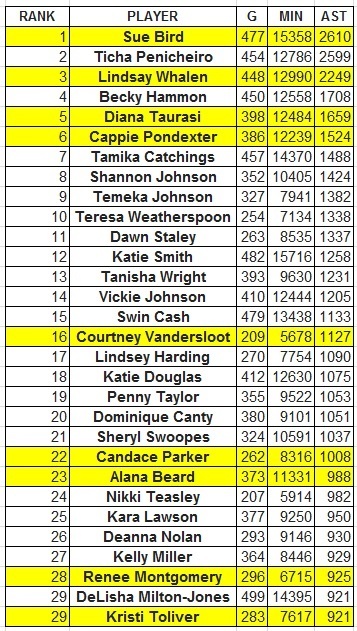 Milton-Jones was able to hold on to all of her rankings after not appearing in any games in the season before she announced her retirement. 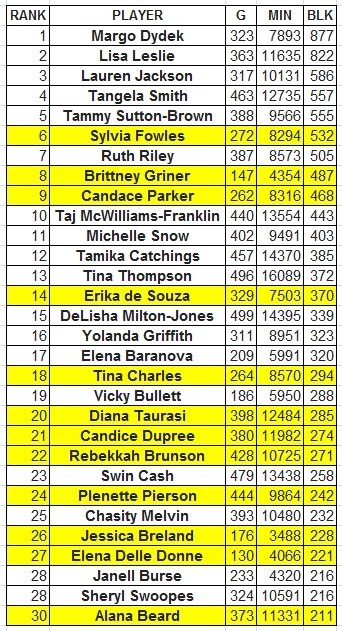 Cash used her last season to get the steals that she needed to make the list on her last category. Now that the regular season is over, let’s take a look at how teams stack up in various statistical categories. With teams playing more games and giving us a larger sample size, some of the extremes noted in previous updates have shrunk. There were some changes in net rating after the Olympic break. In the graph, the blue bars represent offensive rating and the red bars represent defensive rating, leaving the difference between the two as the net rating. 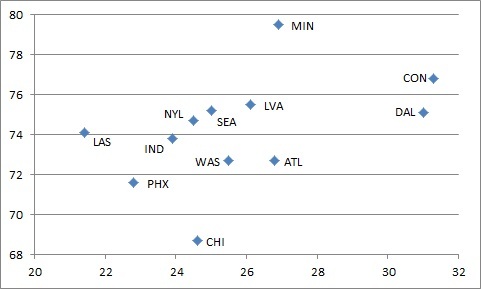 Minnesota had already become the leading defense, but they also took over the offensive leading as Chicago also managed to leapfrog Los Angeles. While only three teams averaged more points per possession than they gave up at the break, the season finished with half of the teams holding a positive net rating. While the top two teams clearly have strength in both categories, the next two teams have very different methods for winning games. Chicago’s offense is excellent and ranked second, but their defense struggles mightily at second worst. New York only has the second most potent offense, but they are a clear third place among defenses. The contrast set up interesting playoff matchups in the second round with the more offensively minded Phoenix visiting New York while defensively oriented Atlanta drew Chicago.